Tuxera SMB is a high-performance alternative for open-source Samba and other SMB/CIFS servers. It has state-of-the-art modular architecture that runs in user or kernel space. This enables Tuxera SMB to achieve maximum I/O throughput, low latency, and ensures the lowest CPU usage and memory footprint compared to other solutions. It supports the Server Message Block (SMB) protocol’s latest features, including SMB 2, SMB 3, and all related security features. 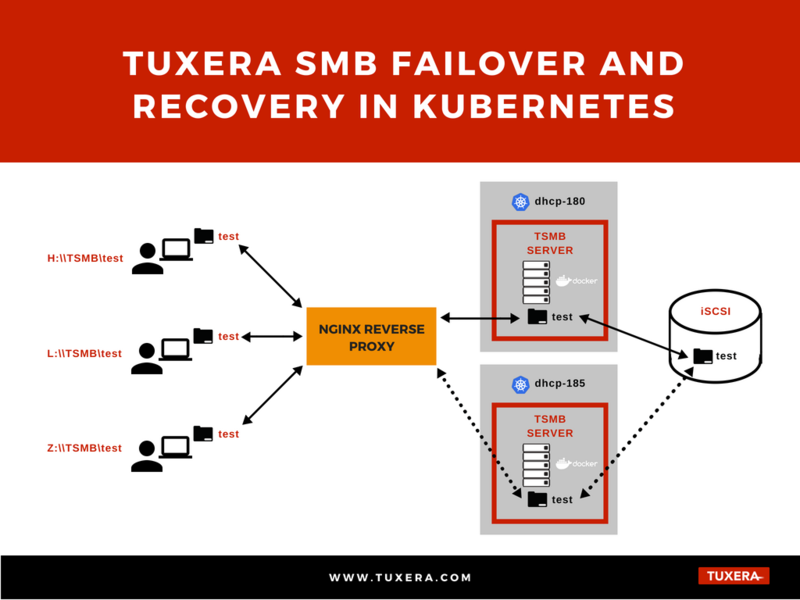 One of the key benefits of Tuxera SMB is its possibility to automatically failover and recover a connection. If a server node fails, terminates, or is shutdown without any prior indication, the SMB client detects the node as unavailable once a time-out or keep-alive mechanism is encountered. This aspect of connection recovery is unreliable and slow. Tuxera SMB reconnects using the TCP “tickle ACK” mechanism. This sends an ACK with invalid fields which triggers a set of TCP exchanges, causing the client to promptly recognize a stale connection and then reconnect. To test recovery, Tuxera SMB is wrapped inside a Docker container and deployed to a Kubernetes cluster. Kubernetes is a portable, extensible open-source platform for managing containerized workloads and services that facilitates both declarative configuration and automation.1 The platform is self-healing by nature.2 This means Kubernetes can restart containers that fail, replaces and reschedules containers when nodes die, kills containers that don’t respond to user-defined health checks, and doesn’t advertise them to clients until they are ready to serve. With this, it’s fairly easy to test Tuxera SMB connection failover and recovery with Tuxera SMB running as a container inside a Kubernetes cluster. A Windows client connects to the Tuxera SMB mount, which is running inside the Kubernetes cluster. Then, a file copy is initiated to the mount to ensure continuous connection. While the file copies, the container running Tuxera SMB is killed explicitly. This causes Kubernetes to reschedule Tuxera SMB into another Kubernetes node and within a few seconds, the copy resumes to the Tuxera SMB mount. To demonstrate Tuxera SMB’s failover and recovery, a file is copied from the user’s local disk on a Windows computer to the mount point \\tshare\test. As soon as copying is initiated, the operation starts with a speed based on the network speed. Then, to force a failure, the pod, tsmb-server which runs the Tuxera SMB container, is deleted during the copy operation. Kubernetes understands the container was deleted and hence starts the Tuxera SMB server container in another server. The end-user would see the copy speed going down to zero for a very short while before the copy resumes instantly. The key point to note here is that copying does not fail, or get interrupted, by any errors. This gives a seamless experience to the user, who would not even notice the server failure on node dhcp-180 and subsequent recovery on the dhcp-185 node. Tuxera SMB server ensures the client waits until the new instance of Tuxera SMB server is started, performs the reconnection and resumes the file copy. The explanation is demonstrated in the video clip below. 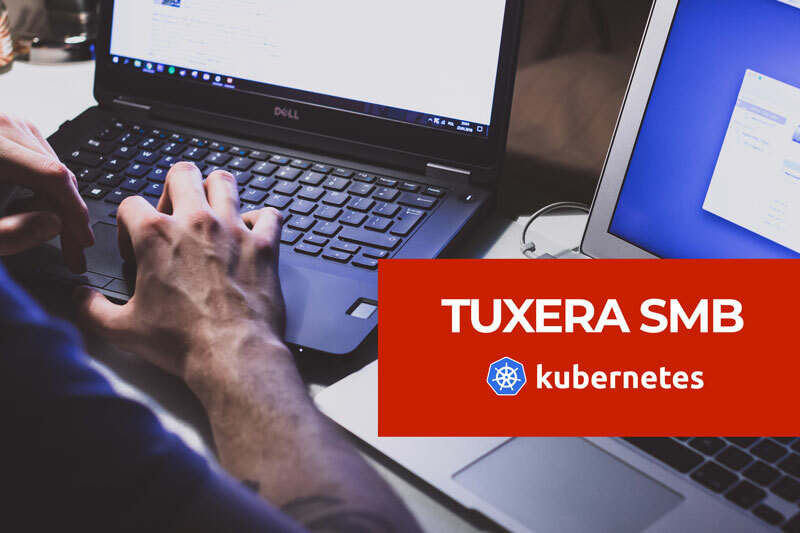 Tuxera SMB leverages the self-healing feature of Kubernetes to transfer Tuxera SMB server container from one host to another when a failure occurs giving users a seamless experience during file copy. As we are already aware that a good end-user’s experience is the key to success, this test demonstrates one of Tuxera SMB’s reliability features: to automatically recover in case of failure without interrupting the user’s needs. The end goal of such a feature is to provide the best user experience, and here we have created a way to test that we can deliver on that promise. Also, in recent times, many organizations are containerizing their infrastructure. Thus, Tuxera SMB would also be a great fit for those customers running Kubernetes on their premises. This allows users to reap the combined features and benefits of Kubernetes and Tuxera SMB. Anoop is a DevOps lead at Tuxera. He has close to 14 years experience in implementing CI/CD systems and test automation. Currently, his focus has been expanding Kubernetes on distributed on-premise servers. In the past, Anoop has implemented tools for downtime free releases and building CI/CD tools. Anoop holds a Master’s in Mobile Technology from University of Jyväskylä.